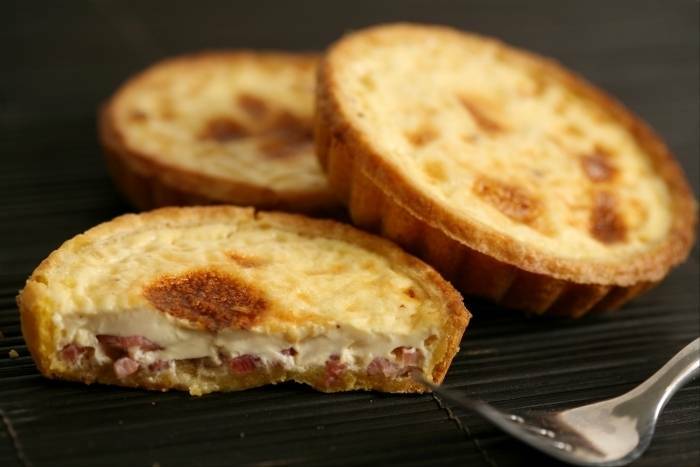 A traditional quiche lorraine cooked in a homemade pastry case. Mix the flour and the butter. Add the egg yolk, a pinch of salt and the water. Mix well without overworking the pastry. Form a disc of pastry and then chill for 1 hour. Roll out the pastry to the size of your quiche dish. Line the dish with the pastry, lightly pressing down around the edges. Rest in the fridge for a further 30 minutes. Beat the milk, cream, whole eggs and egg yolks together. Season with salt, pepper and nutmeg. Heat a frying pan and then add the lardons (no oil or butter is necessary). Cook the lardons until crispy and then remove from the pan and drain on kitchen pepper. Add the lardons to the cream, milk and egg mixture and then pour the quiche filling into the pastry case. Allow the quiche to rest for at least 5 minutes before serving.